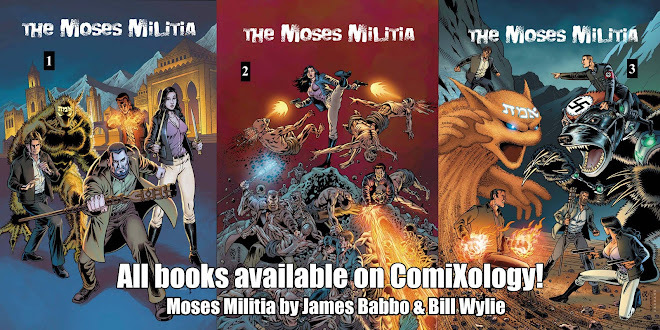 The entire MOSES MILITIA mini-series is finished & at the printers. It's my World War 2 story concerning a team of Jewish soldiers secretly funded by Winston Churchill to undertake missions outside the norm of conventional warfare. In other words "Inglorious Basterds with super-powers!" But add to the mix - the story is set in 1940 Casablanca, Morocco! Yes, THAT Casablanca. Perhaps the scene set in a famous cafe will look familiar to fans of the Golden Age of cinema! 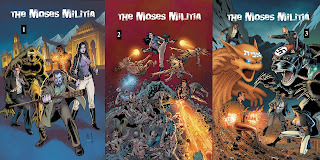 Here are the covers to the series. The art is by Bill Wylie (Secret Defenders, Web of Spider-Man), inked by Mark McKenna (inker extraordinaire), & colors by Chris Sotomayor on covers 1 & 2 and Felix Serrano on #3. Both bring their professional magic to make the covers shine. The entire series will make their debut at Baltimore Comic-Con this Sept 7th & 8th (table A310) along with shot glasses with the title logo on them.